Preheat the oven to 250°F. Line 2 baking sheets with parchment paper. Spread the doughnut pieces on baking sheets and bake for about 30 minutes, until dry on the outside and semi-firm in the center; allow to sit for 30 minutes at room temperature. In a large bowl, whisk together the heavy cream, milk, egg yolks, whole eggs and condensed milk. Add the doughnut pieces and let soak until the pieces are softened, about 1 hour; carefully stir every 15 minutes. Preheat the oven to 350°F. Lightly butter a 9-by-13-inch baking dish. Spread the doughnut mixture into the prepared baking dish and cover with foil. Set the dish in a roasting pan and add enough water to the pan to reach halfway up the side of the baking dish (or place a roasting pan filled with water on the shelf beneath where the pudding will bake). Bake the bread pudding for 40 minutes. Remove the foil and bake for about 20 minutes longer, or until the bread pudding is set. Preheat the broiler. Broil the bread pudding for about 3 minutes, or until top is lightly browned (watch, it will burn quickly). Let cool at room temperature for 30 minutes. Meanwhile, in a medium bowl, whip the remaining 2 cups of cream to semi-soft peaks, stirring in the vanilla. 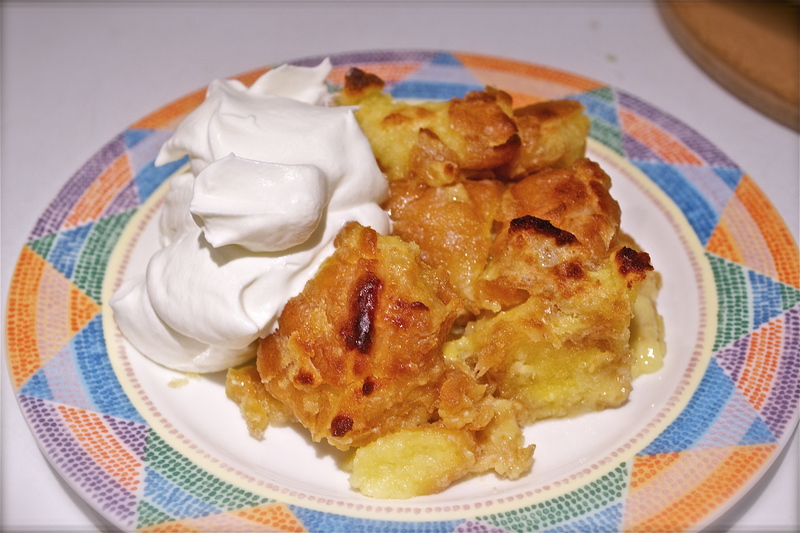 Serve with the warm bread pudding.